It has produced residential archetypes, like California Ranch houses, Case Study homes, dingbat apartments, bungalow courts, idiosyncratic custom-designed homes and many more examples of innovative houses and housing aimed at every income level. In 21st century LA, people are living in tents, cars and RVs; in boats and tiny homes; in ADUs or midsize, multifamily blocks by rail-lines and freeways; in lofts with rooftop swimming pools, luxury high-rise downtown towers and colossal houses in the hills. A modern dome tent covered with a tarp in Venice. Photo by Avishay Artsy. Each in their different way is a response to today’s reality: a massive housing crunch, a web of constraints on construction and a ceaseless flow of people wanting to live here. We explore whether these options are sufficient to meet today’s needs -- and tomorrow’s. Can the region still claim to be a laboratory for residential design ingenuity? Can it once again provide a place called home to people of all income levels? The first episode starts small -- with the cheap modern dome tent, now a common sight on LA’s streets, beaches and riverbeds. 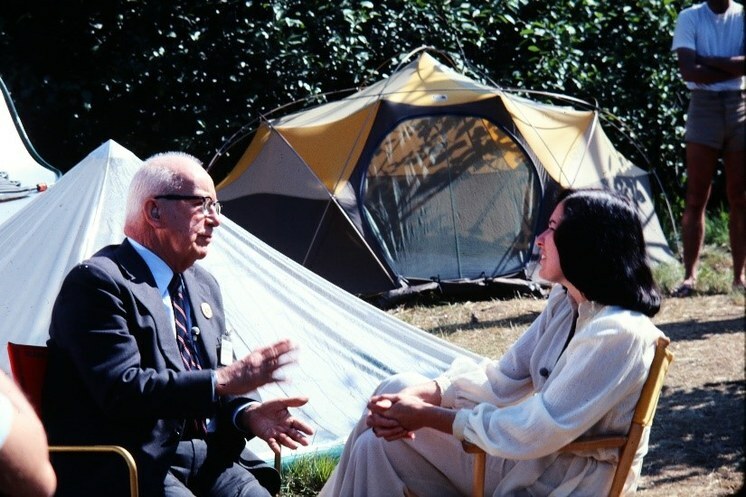 Wade Graham explains how the invention of the modern dome tent by Buckminster Fuller devotees enabled the spread of tent-living in the city. Buckminster Fuller designed the first “Oval intention” in 1975, based on the geodesic dome, the precursor to the modern dome tent. The mobile structure designed originally for extreme environments, like a base camp on Mt. Everest, is a “lightweight, unbelievably strong, mobile, flexible, cheap, mass-producible” form of shelter that offers lessons to the designers and builders of permanent housing in LA. But what is tent-living like for the 50,000 or so homeless people in LA County? DnA producer Avishay Artsy goes to the Venice boardwalk and “Skid Rose” on 3rd Avenue in Venice to find out. 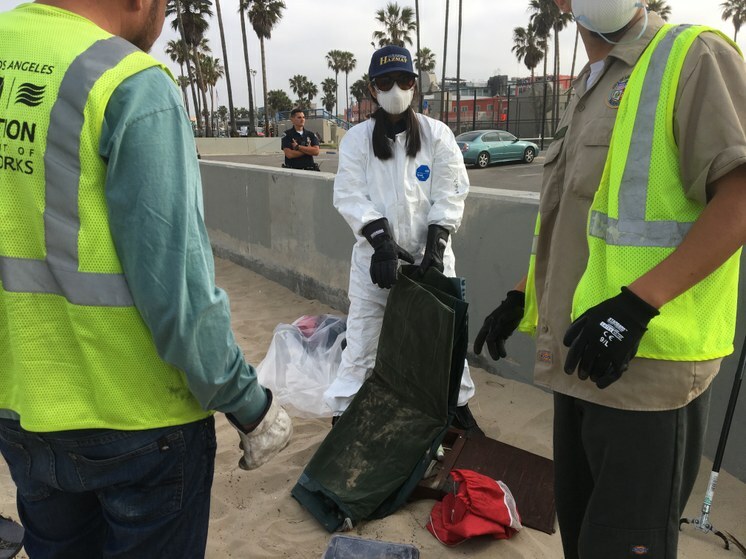 Workers with the LA Department of Sanitation confiscate a homeless person’s belongings on the Venice Boardwalk. Photo by Avishay Artsy. He attended a “sanitation sweep” in which LA police and workers from the city’s Department of Sanitation crack down on what they call the storage of personal property in public areas. Homeless people are given 60 gallon plastic bags to fill with their belongings. Whatever doesn’t fit is put in a garbage truck and brought to a downtown facility, where it’s stored for 90 days. People need to wade through a mountain of other people’s belongings in the hope of reclaiming their possessions. Avishay also went to an encampment early in the morning, where police drive through at 6 a.m. to wake people up and tell them to pack up their tents. It’s against the law to have a tent on the sidewalk between 6 a.m. and 9 p.m.
Women in particular say that a tent ensures their safety. The city is looking to crack down on homelessness around the sites of proposed emergency shelters. LA Mayor Eric Garcetti’s $20 million “A Bridge Home” program seeks to put temporary homeless shelters in every council district in the city, including one in Venice. The shelters would offer supportive services as well as bathrooms, showers and security. Homeless activist David Busch and his tent on Third Avenue in Venice. Photo by Avishay Artsy. Still, the homeless may prefer to stay in their own tents rather than in one of these shelters. 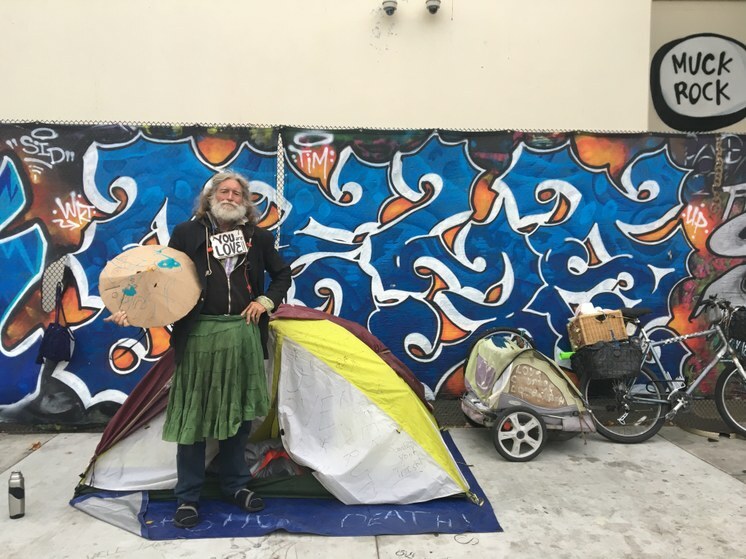 David Busch is one of the best-known homeless activists in Venice. “Typically in a lot of shelter programs you might share a cubicle with four or so folks whereas really with a tent you got your own little space, even if it's just a piece of darkened cloth. You're outside. You got this sense of space around that tent that people kind of instinctively respect. And it's your own little space. It's a great refuge,” Busch said. 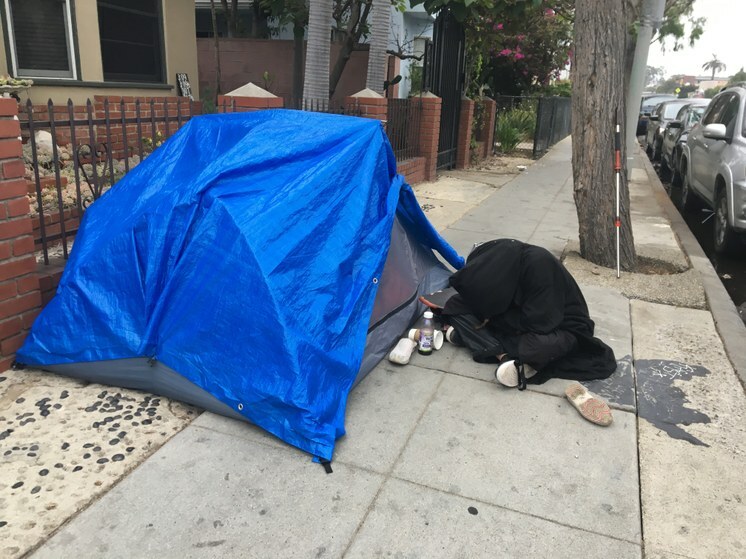 As gentrification has increased in Venice, we are seeing residents of Venice who are paying premium prices to live near the beach butting right up against very poor people who are living in tents or sleeping on the sidewalk. But Busch says he doesn’t understand the concerns or frustrations of the homeowners in Venice who call the police to complain about the homeless. “I think they're very hard to understand, especially in the last decade. The real estate here in Venice for rentals is actually, per square foot, now more expensive than Beverly Hills. It's their presence and their driving up the cost of all the housing here that is making it even more expensive to deal with the unhoused in this community. It's driving up the cost of the programs that most people would consider to be the better alternative, the supportive housing, the transitional housing, and squeezed out fewer and fewer landlords that would make room for a Section 8 voucher applicant,” Busch said. Clifford Moore with his mobile camper on the Venice Boardwalk. Photo by Avishay Artsy. 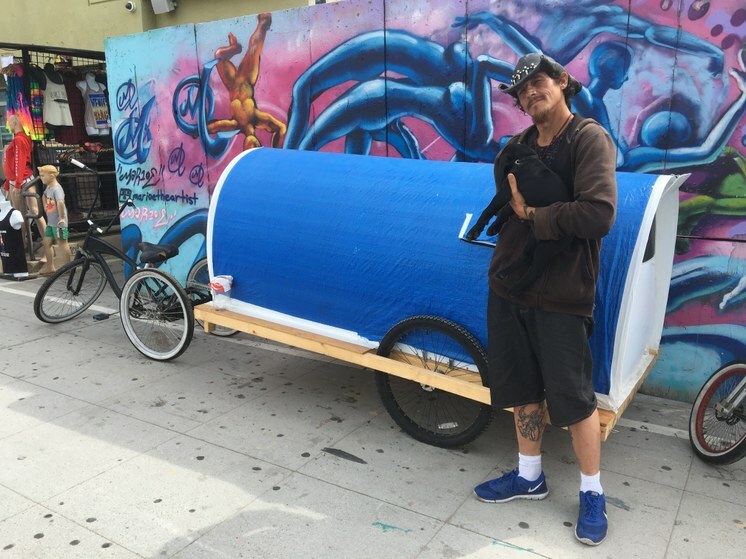 The sanitation sweeps and early-morning wake-up calls from the police have led two enterprising young homeless people to create a rather innovative workaround. Clifford Moore and Billy Young have built bike trailers with campers on the back. Using plywood and corrugated plastic, they built homes on wheels. “Micro-living,” as Moore puts it. They park their bike trailers in handball courts, library parking lots, side streets and bike paths. Moore says each of these mobile campers only costs about $200 in materials, built just using a drill and some hand tools and constructed in a Home Depot parking lot. On the outside they've attached tarps to keep the light out. “Honestly I don't consider myself homeless. I consider myself residentless. Just because, I've got a home. It just doesn't stay in one spot,” Moore said.